This is a Fixxer-Upper Swan Story and I am all about a beautiful before and after. This was a project that was very dramatic from start to finish. Unfortunately, I didn’t think to capture any pics until the demo phase had started, but hindsight is 20/20. The photos pretty much speak for themselves. This is a rental property in Palestine, TX. This property had great bones but had suffered from few updates, tenants trashing the place and some deferred maintenance issues before purchase. When we first walked in the house when it was for sale, it was clear that the potential was there–it just needed some TLC and vision! Check out these awesome BEFORE & AFTER PHOTOS! Bathroom Rehab – Small but Soothing! This bathroom was dated and had a window in the shower. Windows in the shower are more common than you would think–especially in older homes. The showers were not original to the house, so they were added later. They were originally bathtubs only. A new tub was put in, ceramic tile for the shower surround, new hardware and new flooring. The toilet, the built-in cabinet and the vanity were all reused from when the property was purchased. Notice that the natural light from the window is still there–without the maintenance nightmares of the constant wood rot from water sitting on the window sill. Bathroom Rehab – It’s literally a NEW room! It is not a large bathroom by any means, but this makes it feel crisp, clean and inviting. Kitchen Updates – Ooh La La! This is such an amazing transformation! The cabinets are the original cabinets, they were painted with fresh white paint (“Extra White” by Sherwin Williams). New elements of this kitchen include: a new Formica counter-top (this is a prefab counter-top from Lowe’s), new hardware, lots of paint, new sink, tile backsplash, and flooring. The old kitchen faucet was also a wall-mounted faucet, which are VERY prone to bursting in cold weather, so it was a wise move to do a counter-top faucet. The whole feel of the room has changed. It is now light, open and airy and is very welcoming when you walk in! Bye bye Cave Kitchen; Hello Domestic bliss! 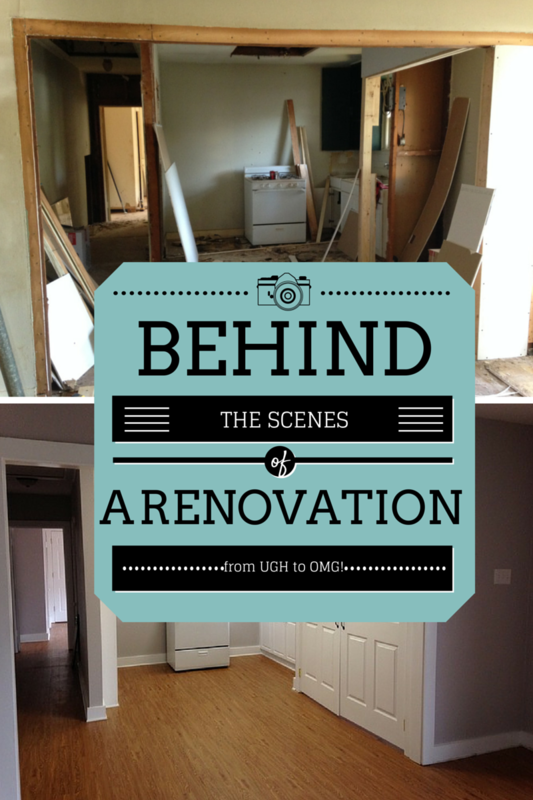 KITCHEN UPDATE: This is such an amazing transformation! From CAVE to COOL! This was one of the biggest changes in the whole property. When purchased, the kitchen was a separate room and there was no laundry room at all. The walls were knocked down to create an open concept kitchen/dining/living room that brings light into the space. I wish I had taken pics before the wall was knocked down, because it looks SO different even than in the before picture I have here. I put an arrow where you can see the line of the old wall. The entrance to the kitchen was from a door in the hallway, which we utlilized as a built-in pantry/display area. The area to the right was framed in and a space for a washer/dryer was added. And YES, that is the same stove from the kitchen pics! Can you believe that?! Elbow grease can work wonders! This poor room had definitely seen better days. The original hardwood floors were soft from decades old termite damage and a new subfloor had to be installed, the damaged sheet rock was repaired and broken windows fixed. A fresh coat of paint and new flooring were added to finish off the room. This was the room that needed the lease amount of work. Unfortunately, the best “before” pic that I have is during demo, so this room was being used to store the doors from the other rooms while work was being completed. The room was painted, broken glass repaired and new flooring installed. Bedroom #2 – Less dramatic, but still great!! So ends another day in the exciting world of property management! This was a fantastic remodel. The before picture was kind of scary, but the potential was there and now it shows! I hope this has inspired you to look beyond what you immediately see in a property, sometimes there is a diamond in the rough just ready to be polished shiny again! So..what do you think? What would you have done differently or would you leave it like it is? Feel free to ask any questions or leave any comments, I’d love to hear from you! Lisa E. Priest loves a fabulous transformation and is an East Texas Area REALTOR® with Picket Fence Realty, Inc. You can reach her via phone or text at 903-948-3343 or email Lisa@rentpalestine.com or at BuyPalestine.com.